That’s right! You can now selectively clear data from a domain (and all of it’s sub domains) with two clicks of the mouse! This tries to clear everything we know about a site, with the exception of bookmarks. There are still a number of issues pending with this to make it even more powerful (help wanted! ), but as it stands, it’s pretty nice. I am, of course, biased. All this work made it in for Firefox 3.1 beta 2, but I’ve been lazy and am just now getting to it. 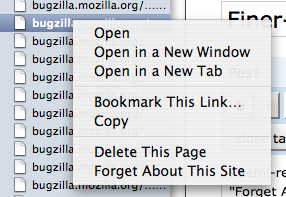 Figure out your changeset url for mozilla-central. For this example, we’ll use http://hg.mozilla.org/mozilla-central/rev/242894260a86. Assuming it applied cleanly, you now have that changeset as a local commit in your repo. You can now push like you always do. Happy landings!